For years people have been complaining about the health of their families on the street that divides Wheatfield and North Tonawanda. Nearby, along Niagara Falls Blvd. 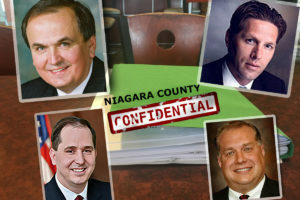 is a large, suspiciously vacant area of green space — the infamous Niagara Sanitation Landfill — where for decades following World War II area chemical companies trucked and dumped their toxic byproducts. Homes were also built and and sold nearby without the new occupants knowing what lurked beneath the soil in that large, vacant area out back. Deadly Love Canal toxic waste got shipped to the Wheatfield landfill just a few miles away when the 102nd Street site started remediation in 1979. 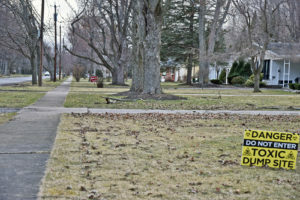 One family still living on Forbes Street today fled their Love Canal neighborhood only to find out their new home in Wheatfield’s semi-rural setting abutted another toxic landfill. Other families have left — abandoning their homes — and have reported improving health. Families on Forbes do not agree with the DEC’s recent declaration that chemicals from the landfill are not migrating to nearby residences based on soil tests, with the agency measuring soil only three inches deep. 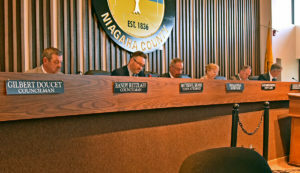 So is the new 23-home subdivision 650 feet from one of the worst waste dumps in Niagara County a good idea? It isn’t the first time the “Aubrey Way” project has come before the Wheatfield town board. Landowner Bob Weaver tried to build 23 homes there in 2015 but the motion to do what happened Monday night failed to get a second from any board member. “He (Weaver) has had soil tests done, and that will all come forward during the environmental review process,” said MacSwan. The motion to move the Aubrey Way subdivision forward to the SEQR process was made Monday by MacSwan and seconded by Curt Doktor, who were both elected in November after facing no competition in the primaries or the general election. Town board members Larry Helwig and Randy Retzlaff voted to approve while Gilbert Doucet was not present. 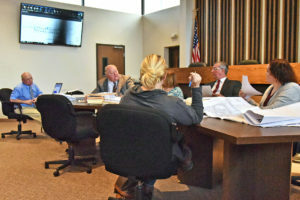 At last week’s planning board meeting — where the Aubrey Way subdivision was approved to be sent to the town board — residents of Forbes Street and Nash Road spoke out against the subdivision for health and quality-of-life reasons. “It’s a chemical dump,” says one woman in the audience. “How far is that going to be away from the where they had the Love Canal waste that they had moved out? How far is the development going to be away from that site. Tim Zuber (above, first from left) responds: “From what I can measure through the GIS system at the closet point it’s over 650 feet,” said Zuber, a project engineer for engineering firm Wendel. “Will that be available to everybody?” the man asks. “Well, we’d like to see it,” the resident says. “What’s the timeline on that?” the man asks. The chairman says, “But we have to go back to the agenda” before he sees another man waiting to speak. After the planning board voted to move the SEQR process to the town board, residents gathered outside. “It’s just disgusting,” said one resident. Other Forbes Street residents have said testing needs to be performed in the houses and basements— not on three inches of topsoil that most likely has been replaced due to yearly flooding. “Why would you want to buy next to a waste dump?” asked another resident. “It’s just sad,” said another resident. Thank you Joe!!!! The truth is in your columns!!!!!!!!!!!!!!!!!!!!!!!!! !